Environmental Affairs Minister Nomvula Mokonyane's office says it knows nothing about claims implicating her in testimony before the state capture commission of inquiry and says it will be "impolitic" to engage reports claiming otherwise. 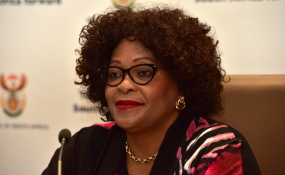 Weekend newspapers reported that Mokonyane would be among several politicians, including former president Jacob Zuma to be implicated by former Bosasa COO Angelo Agrizzi, when he continues testifying before the commission. The company is now known as African Global Operation. Agrizzi has already implicated numerous politicians within the ANC, including a North West MEC, who he claimed went looking for money from Bosasa for an election campaign. Mokonyane is claimed to have received numerous gifts from Bosasa and lavish Christmas parties sponsored by the company. "These allegations have not been presented to the commission under testimony or oath, and neither has the minister been made aware that there's an affidavit that implicates her in any wrongdoing," said her spokesperson Mlimandlela Ndamase. The Sunday Times reported that Mokonyane received 120 crates of cold drinks, four cases of high-quality whiskey, eight lambs and 200kg of beef, among other gifts. But Ndamase said even if the minister was implicated this week, Agrizzi's claims would be "vehemently disputed as untrue and inaccurate". "As and when the allegations are presented before the commission, she is committed to respond to the totality of such allegations in line with the practice and platform provided by the commission," said Ndamase.